The sky’s the limit! When you’ve a zest for life and incredible tenacity, anything’s possible and Cllr David Powell (former Borough Mayor and veteran supremo) is proof mad ideas really take off. 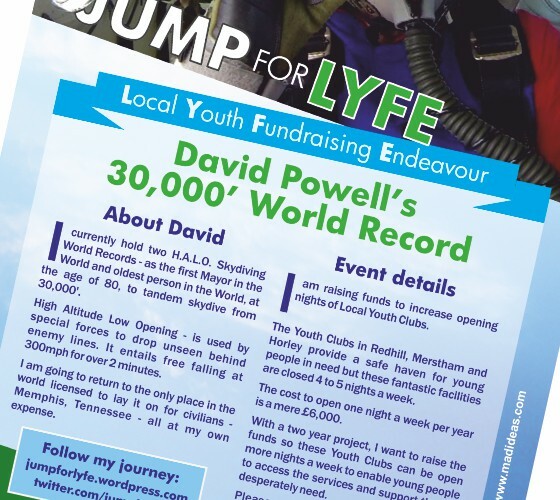 We’re proud to support the Mayor’s charities and events, creating the marketing and promotional materials for ‘Jump for Lyfe’, which supports young people in our communities. David’s World Record breaking feat involved jumping out of a plane at 30,000ft and falling at 300mph alongside tandem partner Alex Coker; US television’s version of Bear Grylls (who also happens to be a former US Special Forces soldier, CIA operative US Marshal). David currently holds two H.A.L.O. Skydiving World Records – as the first Mayor in the World and oldest person in the World, at the age of 80, to tandem skydive from 30,000ft.